Ascend automatically includes the most common payment types. However, you may need additional payment types based on your business operations (e.g. Customer Satisfaction or Barters). 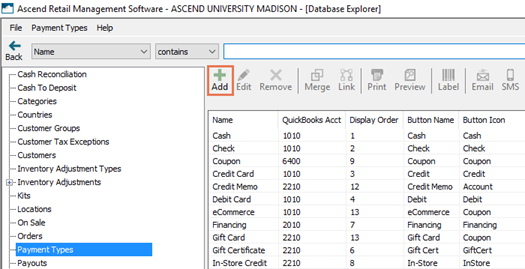 Ascend allows you to add additional, custom payment types to your system. 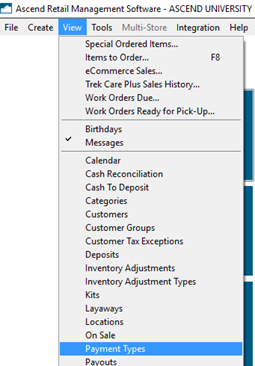 From the Ascend Desktop, select the View menu > Payment Types. In the Name field, enter the name you wish to display in reports (e.g. Customer Satisfaction, Barter). Once set, this value cannot be changed. Check Advanced to limit the payment type only to those users with the Advanced Payments user permission (e.g. managers). In the Button Name field, enter the text you wish to display on the Payment toolbar (e.g. CustomerSat, Barter). From the Button Icon field, select the image you wish to display on the Payment toolbar. 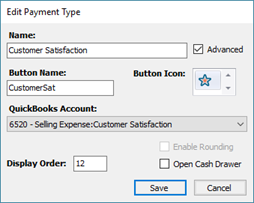 (QuickBooks® users) From the QuickBooks Account drop-down, select the appropriate QuickBooks® account to which the payment should apply. In the Display Order field, enter the order in which you wish to display the payment on the Payment toolbar. Check Enable Rounding if the payment should be rounded. Check Open Cash Drawer if the cash drawer should open for the payment.